AMC Downtown Disney 12 closed, but we don’t want to see you go. Select AMC Stubs members will earn double points on purchases when they visit any AMC, now through July 2019! 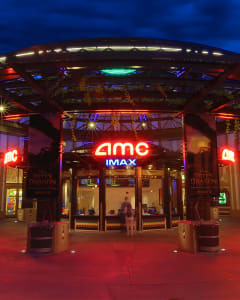 Check out these AMC theatres near you. In 2019, the new AMC Anaheim GardenWalk 6 will open its doors with epic upgrades, including premium recliners. Select AMC Stubs members will earn double points on paid ticket and concessions purchases during the promotion window (7/23/18 - 7/1/19). A qualifying purchase must 1) occur at participating location or on amctheatres.com for showtimes at participating locations, 2) occur during the promotion window, and 3) have the member's AMC Stubs account # associated with the transaction. Double points defined as a 100% bonus on base points earned on paid tickets and concessions. All Bonus Points will be awarded in 2 to 4 days following the completion of a qualifying visit. No bonus points will be awarded for admission tickets provided as part of an A-List Membership. AMC associates are not eligible to participate in this Bonus Point promotion.